Domestic adoption: The LFSRM domestic adoption program is usually for infants and is considered an open adoption program. Open adoption is when birth families and adoptive families work together to have an honest, loving commitment for the best interest of the child. International adoption: The LFSRM international adoption program is for families who are seeking the opportunity to adopt a child who lives outside of the United States. Designated adoption: The LFSRM designated adoption program is when the adoptive family is connected with a birth family prior to agency involvement. LFSRM becomes involved in order to provide the mandatory relinquishment counseling for the birth parents and the education, training, home study, and post-placement services to the adoptive family. 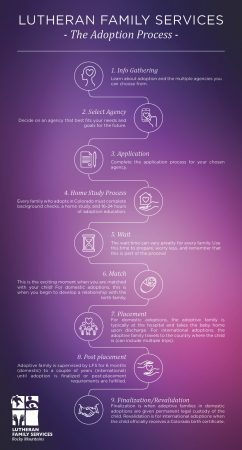 Worried about affording adoption? There are many financial opportunities that adoptive families can work towards. Please contact us to set up an informational meeting and learn more about our agency!